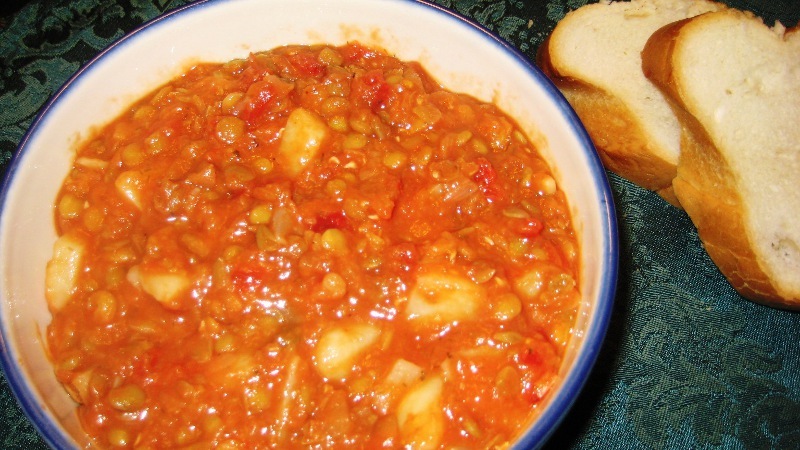 Here’s a recipe for a cold mountain winter – it’s hearty and filling and delicious! We created this from several other lentil recipes but added a twist – a tomato base. In this recipe, it’s important to make sure the lentils are cooked until tender before salt is added; the salt may prevent the lentils from getting tender. Nothing worse than crunchy lentils. Add jalapenos to taste – one tablespoon gives you a medium spicy bite. And the stew is great the next day! If it’s too cold for a dark beer with this stew, you might want to try a hot spiced cider drink, and try to stay warm until spring! Sautée the onion and garlic for 3 to 4 minutes, until onion is transparent. Bring to a boil, and then reduce heat to simmer and cook 30 to 40 minutes, until lentils are tender. DO NOT ADD SALT YET. Salt will prevent the lentils from becoming tender. You may need to add a bit of water to keep the stew from sticking to the bottom of the pan. Stir in 2 peeled russet potatoes (about ½ inch dice). Continue to cook on medium-low for another 20-30 minutes, until potatoes are tender. Stir well. Garnish with fresh dill or parsley and a dollop of non-dairy sour cream.